The Brain Zone Reading and Tutoring Center uses the Math-U-See curriculum in conjunction with other engaging and tactile curricula to systematically address learning gaps and advance mathematical aptitude in everything from basic number recognition and place value to complex fractions and algebra. With its easily understandable manipulative, comprehensive lessons, progressive instruction, systematic review levels, and frequent progress checking assessments, Math-U-See has been the curriculum of choice for parents and schools alike looking for math help for their children. Throughout its 10 years of use here at the Brain Zone learning center, we have seen monumental growth in our students. Simply put, nothing compares to the practical, hands-on approach of Math-U-See. 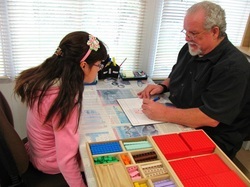 If your child struggles with formulaic computation problems or is encountering difficulty when addressing word problems at any level, call the Brain Zone at 909-606-4863 for a free initial assessment and consultation.